Rain, rain, and more rain has caused area flooding including the basement at Jetty’s new house which is why I’m writing this weeks forecast. With all the rain and flooding you might expect that Lake Michigan water levels are going to rise, and they are, but not as much as you might think. According to the US Army Core of Engineers, Lake Michigan/Huron water levels are currently about 10 inches lower than last year and only forecasted to rise about 3 inches over the next month. Last Week: Friday was light. Jetty called for strong west winds last Saturday and was right on. Early afternoon in Ferrysburg was a popular spot. Sunday turned out to be a strong East wind and consistent enough to ride on Lake Muskegon so we were off on our forecast for that day. Overall it was a “close” forecast. Friday: Wind will continue to strengthen throughout the day, gusting to 35 knots by the time I get out of work. If you are going to brave the cold and big waves the best locations will be Platte Bay and 5th Avenue Beach(Manistee) where wind conditions will be side shore and side on. Saturday: Winds will be light and variable. 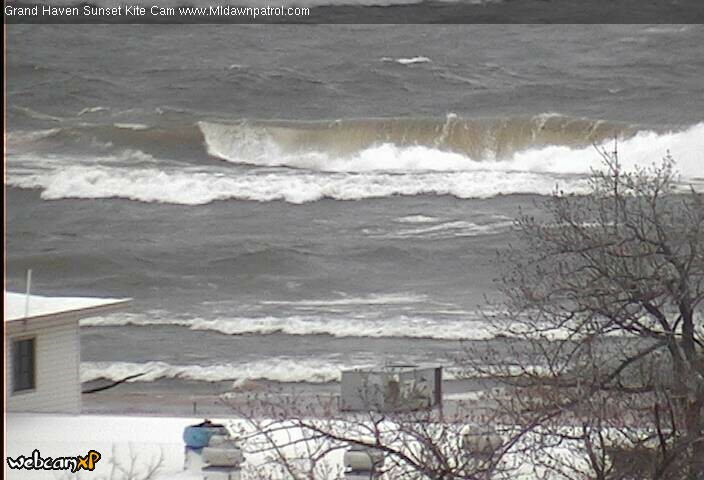 No good opportunities to kiteboard along the Lake Michigan shoreline. Sunday: South to southeast winds and will be pretty light except for little sable point to Pentwater where I’m calling it good enough to ride in the mid afternoon with wind speeds around 20 knots. The webcam pic is sweet. That is a pretty serious wave! Hoping the wind is more South than SE sunday. Yeah hopefully! Maybe we’ll get some sun and it’ll pull it more south..